These two CD’s were my introduction to the pure yet quirky psychedelic folk of Kid Icarus and proved themselves a happy revelation. Kid Icarus is the brainchild of Pennsylvania native Eric Schlittler. His album, Maps of the Saints, although originally recorded and released in 1999 as a cassette, gets a remastered re-release here for the first time on CD. 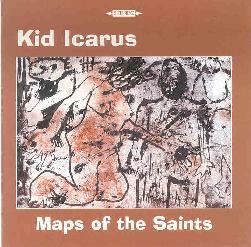 The songs of Kid Icarus are mostly all built around Schlittler’s melodic acoustic guitar playing and idiosyncratic but sincere vocal style, but he injects some truly noisy fuzz guitar here and there, such as on the rocking Laughing Skeletons, and some experimental feedback and flanging explorations like on the edgier Bicycle Spokes, the disorienting and druggy instrumental Lost in 228, and the cool instrumental opening cut Last Chance for a Painting. But at the core of the album, Schlittler is revealed as a terrific songwriter and lyricist, as exemplified on the Bowie-esque Firecracker Girls, the yearning nostalgia of Matchsticks Dance, and the literary intellectual musing of Kafka Song. On all his songs, he displays a diverse and eccentric array of influences from The Beatles, The Velvet Underground and Roky Erikson to Elvis Costello, Robin Hitchcock and Guided by Voices. His choice of the one and only cover song on the album is also intriguing; the almost forgotten pre-disco BeeGees hit Holiday. On Maps of the Saints, he gives the old 60’s song the ultra fuzz treatment, stripping away the pop sheen and harmonies to give it a raw, droning, garage rock feel. In fact, Maps of the Saints remains a strong, honest, and consistently creative musical experience right through all 14 of its tracks. The lo-fi nature of the recording gives it a refreshingly spacious feel as well, with Schlittler going for simple, old school effects, rather than glossed over production. Kid Icarus retains that same lo-fi feel on the more recent recordings found on the Kid Icarus/The Green Chair split EP, but brings a mellower, lusher vibe to his songs. Following Your Divorce and Meet Me On Via Roma combine strumming acoustic guitars, with twangy electric guitar to create melodic, melancholy atmospheres. The third of three Kid Icarus tracks, Talkin’ Observation Deck Blues is a darker, moodier piece, still with lots of strumming acoustic guitar, but also deep organ and spacey backing vocals. The Green Chair is an excellent choice for a split with Kid Icarus. Besides also being from Pennsylvania, The Green Chair exemplifies that sparsely arranged, lo fi folk sound, although He’s Gone also has some searing, acidic electric guitar as well, to give it more of a psychedelic feel. There’s a bit of Dylan influence going on in their song writing style, especially in the purely acoustic Again (which mentions Dylan in the lyrics). Their third song, Fill All the Holes again features some more electric guitar along with punkish acoustic guitar, but this time a little more clean and melodic. All in all, six great songs from two great songwriters on this EP. For more information you can visit the Kid Icarus web site at: http://www.kid-icarus.com. Maps Of The Saints is distributed by Summersteps Records. You can visit their web site at: http://www.summerstepsrecords.com. 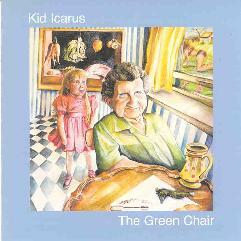 The Kid Icarus/The Green Chair split is distributed by Prison Jazz Records. You can email them at: prisonjazz@yahoo.com.